Our occasional series exploring the eponymous streets of London's boroughs next turns to Tower Hamlets. The likes of Greenwich and Newham have greater numbers of streets to choose from, but with just 13 in the borough Tower Hamlets is far more choosy about who it decides to honour with a street name. The job of investigating these streets is made harder still by one being named after 'John Smith'. There is a John Smith Children's Centre in Stepney Way — named, we are told, by Borough Archivist Malcolm Barr-Hamilton, in honour of the late leader of the Labour party — but John Smith Mews is some distance away. Perhaps it's named in honour of the common man, the John Smith in each of us? James Voller Way and Paul Julius Close cause similar problems. Of Voller, we can find no reference. 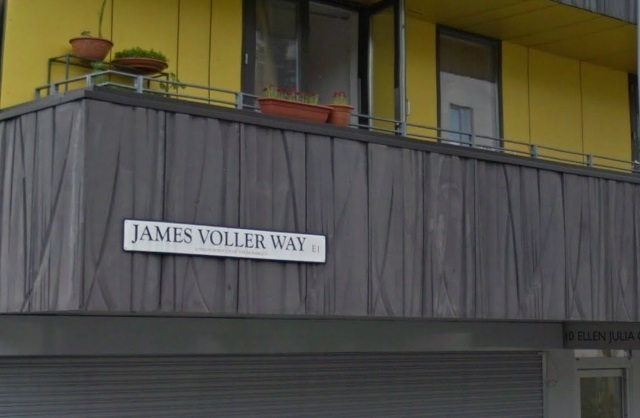 The British Newspaper Archive contains only two James Vollers in London. One was sentenced to two month's hard labour for 'keeping his lady straight' with a hatchet in 1902. The other is a London customs officer, promoted in 1864. Neither sounds promising. Paul Julius could be a reference to Paul Julius Freiherr von Reuter, the founder of the Reuters news agency, who became a naturalised British citizen and lived in London. Then again, any connection with Tower Hamlets has failed to materialise and he's actually buried in Lambeth. Onto surer ground, the arts are represented in the borough by a pair of eponymous streets. Ben Jonson Road is named for the Jacobean playwright and poet who was a friend, and perhaps literary rival, of William Shakespeare. His legacy has certainly suffered the odd sling and arrow at the expense of his fellow writer, though he is today venerated in his own right. Annie Besant (Close) was another writer, though on more lofty subjects — a renowned women's rights and political activist. Hurling herself variously into Marxism, freemasonry, the Indian Home Rule movement and the occult, Besant blazed through 19th and 20th-century life with a zeal that touched many along the way. She's perhaps most famous for drawing attention to the plight of women working in East End match factories, which led to strike action and a gradual improvement in workers' rights. Thomas Fyre was a painter of some regard, but is better known in the East End for his management of a major London porcelain factory in the mid-18th century (though the site is actually within the bounds of Newham). He has a Drive near the Blackwall Tunnel approach. Edmund Hay Currie, meanwhile, was the brains behind the People's Palace, a project to bring entertainment and education to local people on Mile End Road (on a site now owned by Queen Mary University of London). He is honoured with Hay Currie Street near Langdon Park. Geoff Cade is the most recent recipient of a street in his honour. Geoff was a tireless local campaigner, who helped save a number of homes in Aberavon Road from demolition in the 1980s. He loved his local area and was honoured in Geoff Cade Way near Mile End Park, for his lifelong efforts in 2011, six years after he passed away. Elsewhere in Tower Hamlets things become a little murky once more. Daniel Bolt Close may perhaps be named for Captain Daniel Bolt, who helmed a huge ship named the Harbinger between London and Melbourne in the 1870s. Ursula Gould Way is harder still to nail down — one website has a lady of that uncommon name listed as 'Widow of All Hallows the Great', but beyond that the trail runs cold. William Guy Gardens may be named after a medical statistician with connections to Guy's Hospital. Apologies, but we cannot think of anything interesting to say about statistics. John Fisher and Thomas More, however, are easier to fathom. Both were important theologians at the time of Henry VIII, and both met the same grisly end at the hands of that particularly bloodthirsty monarch. By all accounts each ended up on the same mortician's table having been executed within a week or two of each other in the King's Catholic purges of 1535. Each was subsequently canonised by the Catholic Church, making them perhaps the most saintly of Tower Hamlets' honoured few. Can you identify any of our missing Tower Hamlets subjects? Have we found the wrong William Guy or Daniel Bolt? Let us know in the comments.